Each Public Space Action is identified by color and an action word. Together, actions form a Public Space Language to facilitate personal and collective dialogues with an individual place or system of spaces. While some landmark public space projects, like New York’s Highline, produce a great deal of excitement and participation, other projects mainly attract the NIMBY (Not In My Back Yard) crowd, while most small scale neighborhood public space projects with low potential for generating economic growth fail to generate the kind of participation that would benefit not only the design of the project, but also the ongoing community engagement vital to sustaining the public space over time. These observations led me to the question: How does a design professional engage people to participate in the development of neighborhood public spaces in such a way that they see those spaces as an integral and ongoing part of their daily lives? Last fall, I coordinated two projects, Framing Lafayette Park and Share A Chair, in two parks in Salem Massachusetts that begin to explore this question on site. In exploring the initial question, I find that the first step requires people to look at a particular space with fresh eyes. The second step requires the dynamic participation of the resident with the space through certain actions. 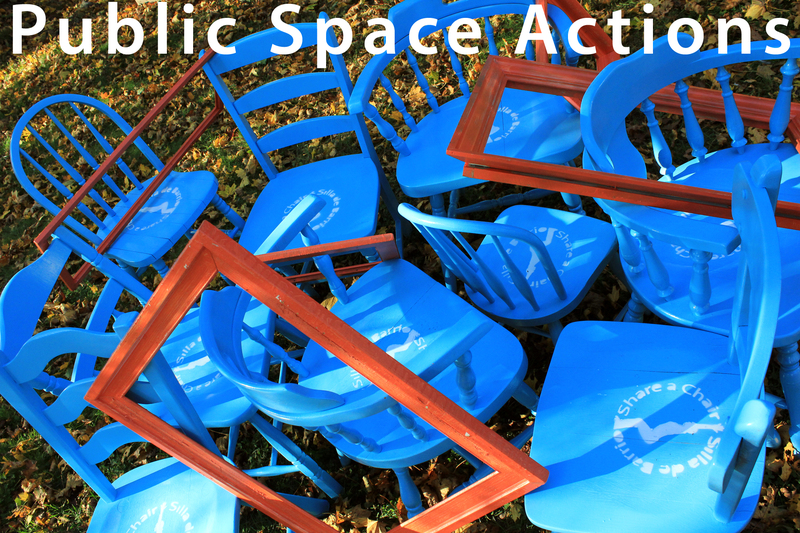 Dynamic Participation is facilitated by Actions in Public Space. Actions in Public Space are objects and/or events offered in a public space to facilitate unexpected and unaccustomed interactions and “fresh eye” observations from users; actions stimulate a response. B. Participation should be a sustained effort over time and not just for a specific time frame. C. Participation should happen on site as a complement to official community center rooms. Open Engagement: On site engagement begins an open-ended dialogue between the users and the facilitators. At the beginning, there is no agenda other than to get to know the space in question. This is an advantage to the current practice of targeting a particular space for a particular problem or pre-determined project, which can overlook some of the good currently on site, as well as other more subtle and complex problems. Local Participation: Since the engagement is to happen on the specific site in question, this ensures local people in the immediate surroundings have the best opportunity for engagement, even if they are unaccustomed to or don’t have time to attend community meetings. Personal Observations: People are prompted to reflect on the space with the opportunity for personal observation in their own time. Personal Observation is more difficult in the community room setting where, even if models and plans are employed, the engagement between the space and the individual are abstract; if the individual has been to the space, the engagement is still removed as it is not immediate and based on remembrances. More spontaneous, individual participatory process would complement the current process. Sustained Exploration: People might be prompted to walk over to other close public spaces and begin to see them as part of the system of public spaces that make up the neighborhood.